I recently had a customer report that their Windows 10 deployment was taking 7+ hours to complete at one of their remote sites. After confirming that the machine was pulling content from it’s local Distribution Point, I started looking at the server itself, which is running Windows Server 2016. The customer mentioned to me that they had enabled LEDBAT on this Distribution Point via the ConfigMgr console, and had then disabled it after hearing reports of OSD issues at this site. I came across this article which stated that a misconfiguration of LEDBAT could cause slow download speeds when pulling content from a Distribution Point, so I decided to double check that this wasn’t the case. Instead I found that there were still traces of incorrect LEDBAT configuration on this server even though it had been disabled via the ConfigMgr console. After running the following PowerShell command to remove this configuration, and then confirming it no longer existed, build times returned to normal! Note that the Primary Site server has the latest 1806 update rollup installed which has fixes for LEDBAT configuration issues, however I am not sure if it was installed after LEDBAT had been enabled on this Distribution Point. So if you hear that deployments are taking a long time to complete, check that LEDBAT misconfiguration isn’t causing the problem! I just completed a new SCCM Primary Site installation for a customer who has a requirement of HTTPS communication only. Failed to get client version for sending state messages. Error 0x8004100e. Failed to get client certificate for transportation. Error 0x87d00282. 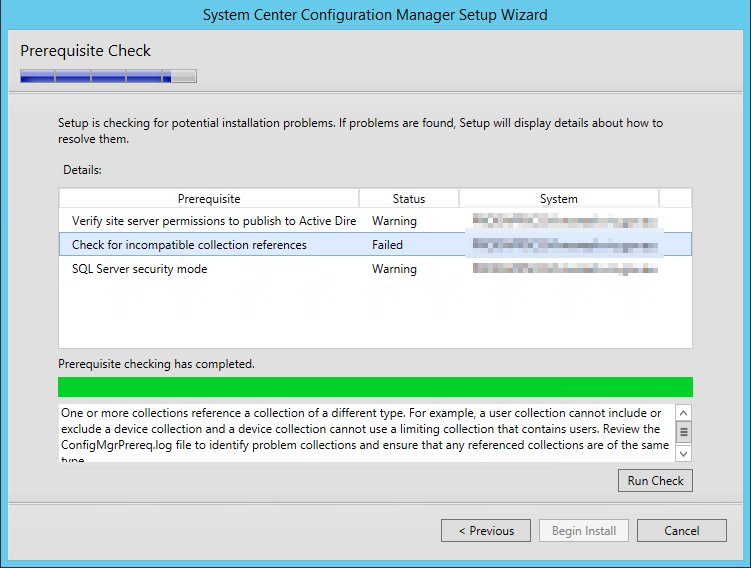 There are at least 2 certificates valid for ConfigMgr usage that meet the selection criteria. The ‘Select First Certificate’ registry entry was set to OFF so a certificate cannot be selected. That last point is where I focused my troubleshooting efforts on. 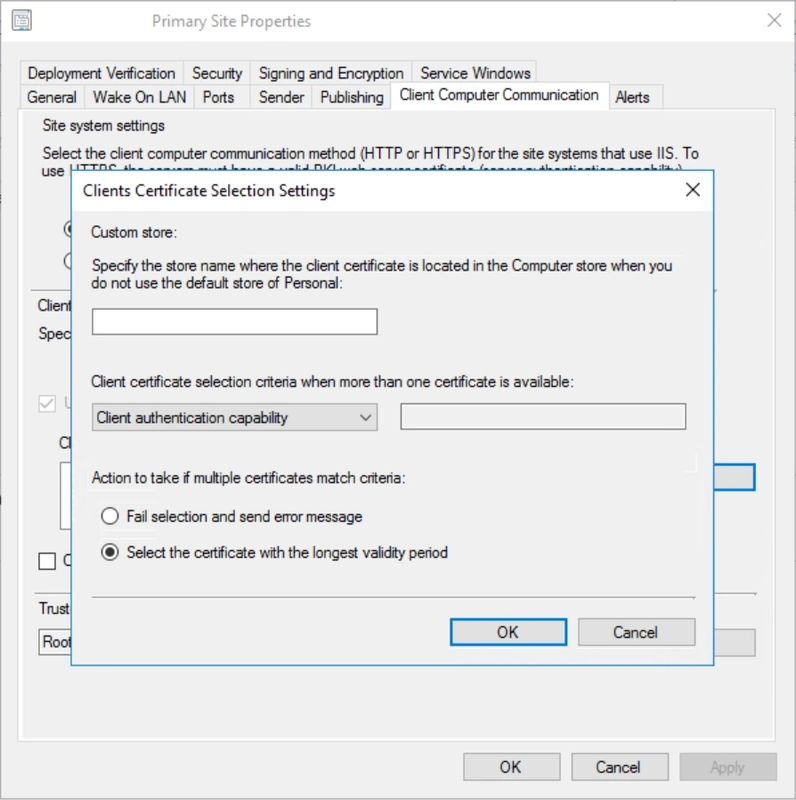 From previous experience, I know that I should check client certificate selection settings to confirm that the client should select the certificate with the longest validity period. This setting is correct and has been for quite some time so I know that the client is ignoring this, or not getting the correct information. CCMFIRSTCERT (Tells SCCM to use the certificate with the longest validity period). CCMCERTID (Tells SCCM to use a specific certificate based on thumbprint). ccmsetup.exe /UsePKICert /NoCRLCheck CCMFIRSTCERT=1 SMSSITECODE=P01 CCMCERTID=”MY;D29211C57353FB9FB8944AFF6C14770D9AD4D58C”. Looking at the logs I can see that the switches have been accepted and the client should be doing the right thing, but unfortunately, it still presents the same errors. Looking at registry settings from other clients that use HTTPS and are working I can see the following Dword. HKEY_LOCAL_MACHINE\SOFTWARE\Microsoft\CCM\Security\Select First Certificate = 1. Manually creating this registry key works and the client is now able to communicate with the MP. During a recent Windows 10 SOE engagement, our customer reported that the ConfigMgr Software Center would crash a few minutes after opening it with the error “SCClient has stopped working”. Upon investigation it turns out that other applications, such as the PowerShell ISE, were also randomly crashing with the same issue. 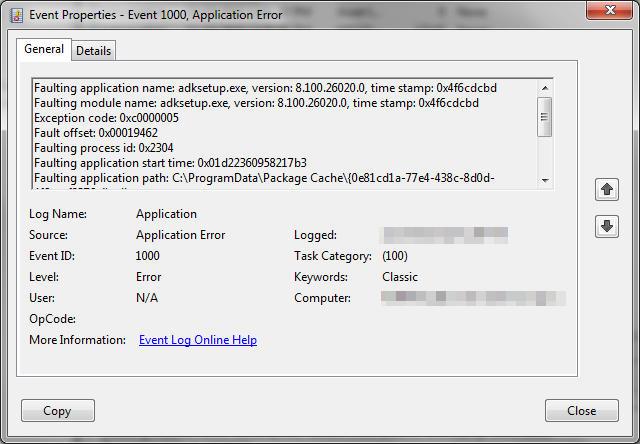 The Application Event Log pointed towards .NET Runtime, however the issue was only happening on a specific model (the HP EliteDesk 800 G1) – other hardware models running the same Windows 10 SOE were fine. So it was a hardware specific issue and fortunately it turned out to be a simple solution – the ‘latest’ graphics provided by HP for the Intel HD Graphics 4600 graphics card, which was several years old, was causing the issue. Updating the driver to the latest release from Intel’s website, which had been released in early this year, fixed the problem! One of our customers is having an issue with ConfigMgr Current Branch 1702 where the Task Sequence engine is reporting ‘there are no task sequences available to this computer’ when using Unknown Computer Support. According to this post on Reddit, Microsoft is aware of a known bug in 1702 where the SMSUID of the x64 Unknown Computer object is assigned to another computer object, rather than it generating a new SMSUID. We can then run the following query to locate the computer object using this SMSUID. We can see that another computer object has this SMSUID! Therefore we receive ‘there are no task sequences available to this computer’ as the Task Sequence engine processing assigned Task Sequence deployments for that machine. 2. Delete the computer object that has the same SMSUID as the x64 Unknown Computer object, delete SMSCFG.ini on the machine and restart ccmexec to generate a new SMSUID. During a recent ConfigMgr 1511 to 1606 site upgrade, we updated the Windows ADK for Windows 10 from version 1511 to version 1607 prior to upgrading the Primary Site server. Prior to performing this change, we found that the Windows ADK 8.1 was still installed on the Primary Site server and decided to uninstall it as only the Windows ADK for Windows 10 1607 is required. 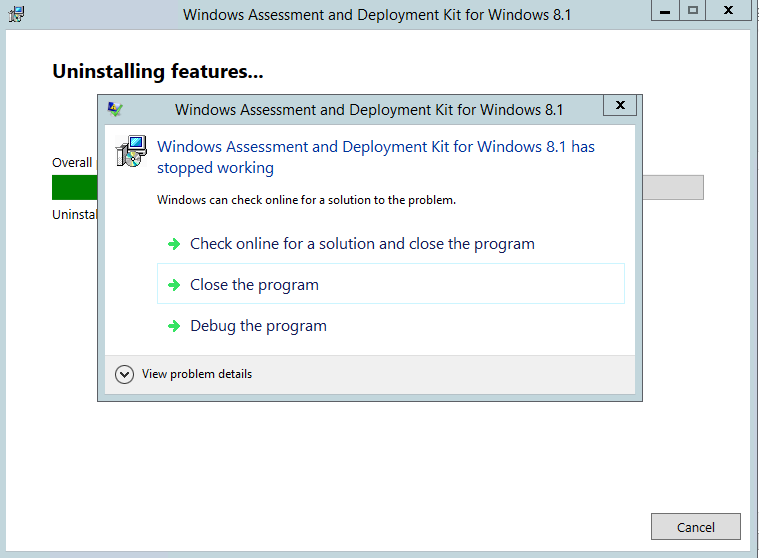 During the removal process of the Windows ADK for Windows 8.1, adksetup.exe crashed during the uninstall of the Windows Preinstallation Environment component. Examining event viewer on the server showed the faulting application. Fortunately, the solution was fairly straight forward; reinstalling the Windows ADK 8.1 caused all installed components to re-register and after the process completed, we were able to successfully uninstall it!